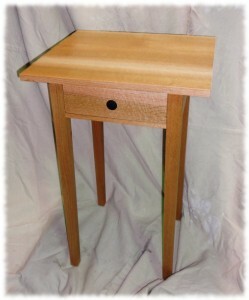 I finished the first nightstand this week. Okay, I completed everything except the finish. I’m planning on building the second table and then applying finish to both. Overall, the table turned out okay. It isn’t perfect, but looks nice. The drawer is still a touch tight, so I may plane the sides a touch thinner before applying the finish. This is a pretty basic piece of furniture. 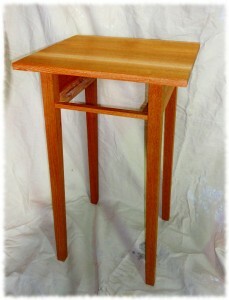 The four legs are square, with a slight taper starting 6-inches from the top. The aprons and stretchers are connected using mortises and tenons. 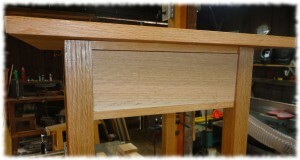 The top was constructed from thee pieces of oak, and attached using screws. 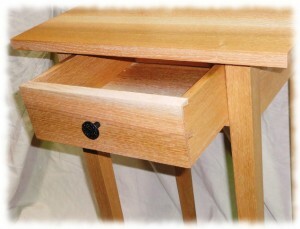 The drawer is made from solid oak. The box is constructed with dovetails. They are hand-cut dovetails, and it was my first attempt at making a drawer, so the dovetails aren’t perfect. The bottom is made from two pieces of oak that I resawed (by hand – they were too wide for the bandsaw) to 3/8″ thick. The wood is clear and the case looks nice. 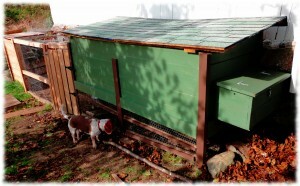 It is built from quartersawn red oak that I had cut from a tree that was taken down in Ledyard two years ago. I have an entire section of the tree cut into boards, so I have enough wood to make a full matching bedroom set. Most of the joinery is pretty clean. Not perfect, but it is getting better. The drawer front is a good fit. I’m hoping that there is enough gap that the drawer won’t bind in the summer, but it is quartersawn and shouldn’t move too much. I will try routing the mortises on the router table. I don’t have the best mortise chisel for 1/4″ mortises. 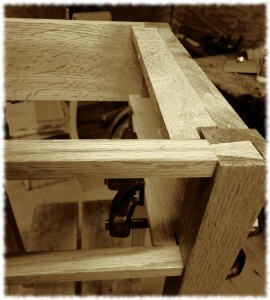 I think the router table may be quicker to get all the mortises finished. But I am not sure if I can get the full depth of mortise on the router table. 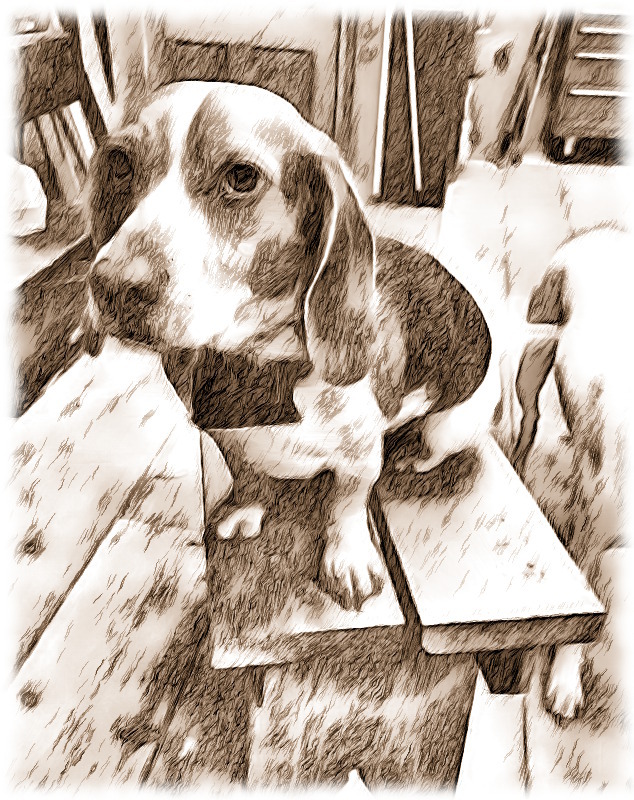 The current mortises are 1″ deep. I’ll be more careful on the thickness of the spacers to guide the drawer. On this project they were a little too thick which requires me to plane the sides of the drawers a little thinner (and leaves a little larger gap around the drawers than I wanted). I need to be more careful making sure that the drawer front and sides are flush on the bottom. I would like to have the dovetails be cleaner right off the saw. I know that just comes with practice. The half-blind dovetails were tough to get clean. I need a better bench to cut joinery on. I need a better way to hold the piece down when I’m cleaning out the dovetails. 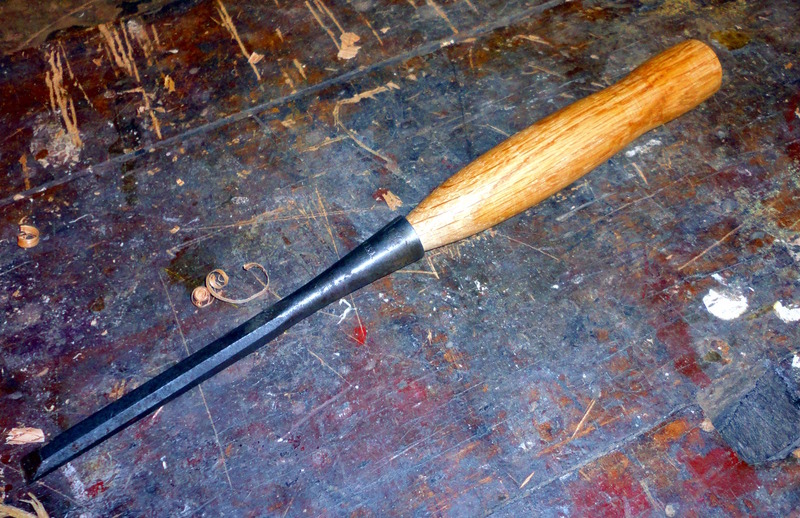 I never properly sharpened my skew chisels. That (and the previous comment) made for a bigger pain cleaning out the half-blind dovetails than they should have been. A dovetail chisel would be a nice addition to the toolbox. We are having a nice lazy Sunday morning. It is brisk and overcast outside – a perfect day to do inside things. The boys are enjoying a rare morning just taking it easy playing on their electronics. Susanna is hanging out with them. I headed out to the workshop. I cleaned up the drawer runners and top cleats. I then placed the nightstand top down on the router table (it is a good flat assembly surface) and centered the base on the top. I attached the top to the base with 4 screws through the cleats. I pre-drilled the holes in the cleats a little large, to give the top some room to move as the wood changes sizes as the moisture in the air changes seasonally. Yesterday I said I would probably build the second table before building the drawer. Today I changed my mind. I started milling the lumber for the drawer. I milled a piece for the drawer front, but the wood had a crack in it, so I had to mill a second piece. I carefully fitted the drawer front to the opening, leaving about 1/32″ gap on the top to allow for wood expansion. I milled stock for the drawer sides. However, the rough lumber I have is very thick (almost 1 1/2″ thick). Instead of planing down the thick lumber to thin drawer sides, I decided to try to resaw the sides from a single piece of lumber. My bandsaw isn’t the best, but the blade is sharp so I decided to give it a try. It turned out perfect. 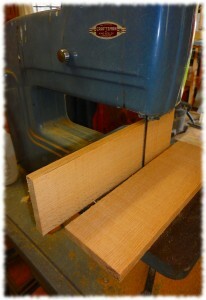 I have to resaw the wood for the drawer bottom as well, but the stock is wider than the 4″ resaw capacity on my bandsaw. I’ll try to resaw the drawer bottom by hand. The drawer sides after resawing. I’ll run them over the jointer one time and then plane them to just under 1/2″ thick. Nightstand after glue-up. The top is just resting on the base. An initial coat of shellac has been applied to the table. I’m making progress on the night stand. I took some vacation time yesterday afternoon to meet the boys off the bus. I was able to get the first table glued before I took Ben to basketball camp. It isn’t perfect, but I feel pretty good about the construction. Today I applied shellac to the base and top. I wound up making the top a little narrower (I had planned 20″ wide and wound up with 18″ wide). When I put the top on the base, it seemed a bit wide. Susanna agreed with me, and it took 30 seconds to run the top across the table saw and remove the 2-inches. Tonight I glued in the cleats to attach the top as well as the runner for the drawer. 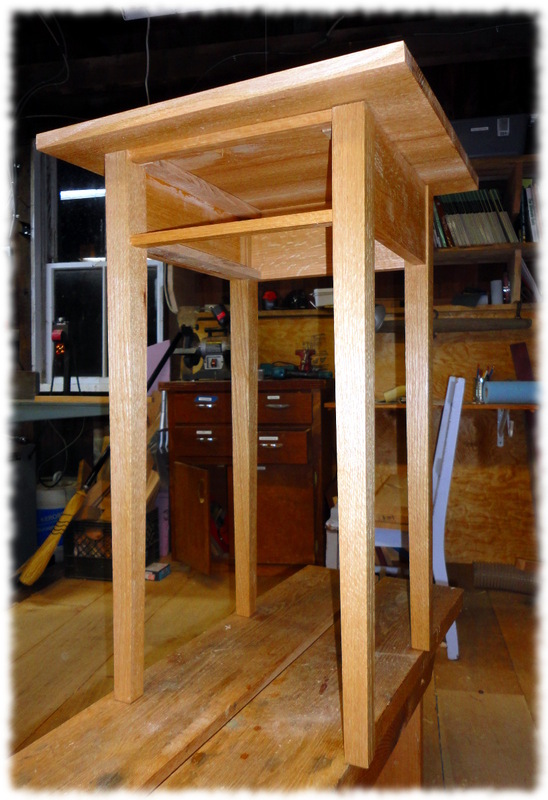 Tomorrow I will attach the top and make sure the project is cleaned up and ready for the drawer to be built. 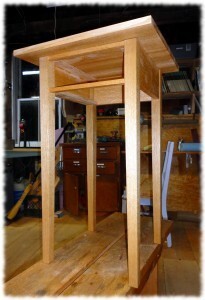 I’ll probably build the second table before building the drawers, but that is always open for change. I also haven’t decided on a final finish for the tables. I may get some more water-based finish to spray on, or I may just use a wiping varnish. I’m leaning towards the spray finish – it will offer a little more protection than just the wipe on varnish. I have wiping varnish on hand, but I would have to go purchase more water-based finish to spray. Luckily, I don’t have to decide right away. The shellac will offer a little protection until I put a real finish on it, and they don’t need to be ready until Christmas anyway. The weather last weekend was beautiful. Sunday was perfect for painting the chicken coop. The plan had been to let the wood dry for a while, and then paint to match the house colors. Now all I need to do is paint the garage behind it to match the house.